for February 21st are Joyful. 2. R. And this is us, the sons of Abraham – the children of light, the children of Israel. R. And so our Lord says to us today that He is testing us, for He has for us a great mission and He has asked us for obedience and He has asked us to follow His directions. The Lord has a plan far beyond the scope of this earth that any of us can comprehend (and the world has veered so much to the right and to the left and) in order for this sick world to come back to be on target to be living in the truth according to His Word that men will see the light as of seven suns, that men will know God most intimately. Going from where they are to the place where the Father had intended is a great difference. And so we are here living in this world today in a barren land that has veered so far in a desert. And the time will come when great grace will flow from the highest mountain from the altars of sacrifice, when holy priests are offering sacrifice from the highest mountain. And it will majorly come to the effects that the Shepherds of Christ Movement has on the Church and the world. So why would we not be attacked this day, why would not the devil try to attack us immensely with division for this is God’s tool, and the tool that the Lord gives to us is love. But He asks of us obedience and He asks of us to adhere strictly to the commandments, He asks of us to live in purity and in truth. Meditate on the resurrected Lord that came forth from the tomb victorious on the third day. He gave His life and His death, He hung on a tree and He shed His blood that we would have new life. And if we walk in His footprints we too will walk in the shades of death as He did to the hill of victory. 8. R. This is from Matthew. R. A reading from the Acts of the Apostles. say what thou didst see upon the way. 3. R. A reading from the book of the prophet, Isaiah. 4. R. A reading from the Holy Gospel according to John. 6. R. This is another time that Jesus called His Mother, “woman”. This is what the soldiers did. Near the cross of Jesus stood his mother and his mother’s sister, Mary the wife of Clopas, and Mary of Magdala. Seeing his mother and the disciple whom he loved standing near her, Jesus said to his mother, ‘Woman, this is your son.’ Then to the disciple he said, ‘This is your mother.’ And from that hour the disciple took her into his home. 8. Jesus: My beloved ones, you see the wonderful things that your God has done, but you do not comprehend My Might and My power. I give to you the plan of the Father, this is what I reveal to you here in order to help bring the Church and the world into renewal. You see with the light of seven suns as you have never seen before, you comprehend most fully the scriptures. I am alive in your heart and you know Me most intimately. When the world that surrounds you sleeps and slumbers, you know Me in your heart and you suffer immensely for this knowledge and this realization that I have given to you, but you are comforted by the great joy to know your God alive within you. I am truly alive and in your heart My beloved shepherds. Do you thank your God for the gifts that He has given to You? I am a most personal God. I am not far off in your life. I am with you in your every breath and you know this far more than the greatest saints, for I have revealed Myself to you in these great lights and the world does not know the great treasure that I give to you. I am alive and in your heart this day and I ask for your gratitude, appreciation and obedience, that this world will know Me most intimately through the work that you will do. I am asking you to put aside all willfulness and to surrender to the plan that I give to you. I will form a religious order through the Shepherds of Christ Movement, through the priests, through the Handmaids, and through the lay apostles. It is a stringent order that I give to you, rooted in the truth to bring about the renewal of the Church and the world. When you are fighting the plan you are fighting Me. You are listening to satan create confusion and division in your heads and you are not seeing the top of the mountain, or the grace that will flow from the highest altars as the priests celebrate the Holy Sacrifice of the Mass. I need you My beloved apostles that I have called, but you can say no and have your own plan and go your own way. I need commitment as a religious person to the Shepherds of Christ Movement that I have designed and created through My own hand. I give to you the plan of the Father, I ask you to comply with the wishes of the Father. I ask you to put aside your will. I ask you to live in the Father’s will. In the end there will be a new earth, all living according to the Father’s will in great love and harmony. Willfulness will be blotted out, for there will be but one plan and it is that of the Father’s. I give to you the plan of the Father. 9. R. I am not afraid, my Jesus, for I wake in the middle of the night and I feel the suffering within my heart, and I feel the pains of division as the devil makes more and more confusion in the Movement to stop the great work that we do here. But the greatest joy of my life are the experiences I receive at the top of the mountain given abundantly in the Mass when I am one with all. And I know this: to be divided from any person causes me to be separated from You, for You are one with all in the greatest love. And this harmony, in order to receive the greatest grace in the Mass, depends on putting aside the seeds of division that the devil wishes to plant in the hearts. It is to my own detriment to foster seeds of division. And this is why You have given to us the plan, which IS the hourly prayer that You keep telling us that, we must do. If it is only to pray the three prayers and to say “for the grace to get through the next hour.” But You have taught us that we must pray for grace and for funds, for this is Your Movement, and it is through the prayers that You will release great grace to help bring about the Reign of the Sacred Heart. Why should we expect that we give nothing and receive so much? 10. R. And what is the price that He paid that this grace would be released? Was it not His death, the last drop of His blood, His life given that we would share in His Divine life? Did He not pay dearly for the gift that we receive? Why should we not think that we too must pray to receive the grace that is needed in order to transform the earth? And it becomes so clear in the writings and scriptures - which I do not even know, only as He has revealed them, for I am not a scripture scholar. It is in knowing Him and dwelling in His Heart that the Word of God has become alive within my heart. It is not sitting around the brown table with our thinking caps on that we learn the scriptures, it is in dwelling in the Heart of Jesus, in going to the Eucharist and to the Mass where great grace is outpoured and in consecrating our hearts to Jesus and Mary that the Word comes alive inside of us. So does it matter if I have a 140 I.Q. or whatever it is? What matters to the Almighty God when He plants His Word within a heart is that the heart is open, that the heart gives itself to God, and that the heart loves. He has revealed the greatest mysteries to the merest children. Jesus: Sit you on a chair and feel the earth press in and feel distraught in your heart, and what good does it do, for if you would have asked for My grace I would have given it to you, but you did not ask. And the devil came with his bag of tricks and his dark seeds that he wanted to plant in your heart. And he sifted them over your heart and you let him burrow a hole and get in. And now you say to Me, “Lord, Lord where are You? For I saw You at the top of the mountain yesterday, and today You are so far from me.” And I say to you, “But you did not pray for that grace, which I would have given if you would have asked.” For I want to be one in you, to live in you, and operate in you in this world that is hurting and in pain. And I say to you, feed the hungry, feed the hungry; and so many of you go to the haughty. Why do you go to the haughty when they are the hungry? Feed the hungry, I say to you. Go to the highways and the byways, bring in the beggars and the ones that are open. The rich with their haughty hearts, let them rot in the sun. And when their radiators overheat for the hotness of the day that bakes on them, will scald them, and they will come crying and you will say, “When I called, you would not listen.” I say to you once again to feed the hungry. Go to the open, go to the ones that are one, that want to unite and to spread the Word. You are planting seeds that must be scattered in many hearts through the consecration. Go to the ones that will consecrate their hearts, that will be children of light, not children of satan that want trickery and argumentation. You are not to argue, My beloved shepherds, you are to stand for the truth. Feed the hungry, I say to you, feed the hungry. How many are in hospitals and they are ill, but they are far more ill in their hearts than in their bodies. For the blind man may not see the things of the earth, but in his heart he can see into the mysteries of the Almighty God. You see but you do not see, you hear but you do not hear, you are blind and you are deaf, and I give to you the lights of glory and satan comes with his little bag of seeds and makes division among the shepherds. I love you and have given you these great gifts, not given to the greatest saints. I have revealed Myself most intimately to you as never before in the history of man, and the gift that I give to you is not accepted by so many. I am God and I am asking you to proceed ahead with faith, for so much of your time is wasted. Proceed ahead, ahead, ahead, I tell you. Stay at the top of the mountain. So many of My shepherd apostles have caused such confusion. Please, I beg you, pray hourly. You must stay in the state of abundant grace to operate as I ask you to, for the devil comes with his little bag of black seeds and thoughts in your heart. So many of you listen to your heads and not your hearts, the message is given in the heart. And so you think. “And God is talking to me and He tells me what to do,” and you hear the words. I am asking you to live in your hearts, to live by the Blue Book messages. I speak in the heart. You must feel the nagging in your heart. Discern the spirits. You know Me in your heart, and in a second you can be off because you got an inkling, and so you run and you are in satan’s lair. I communicate to you in your heart. You must spend time everyday before the tabernacle. You need the grace, My shepherd leaders, My shepherd apostles, in order to handle what you are handling. Live by the Blue Book messages. I am asking you to read the third Blue Book, a message everyday, this will keep your focus on love of God and love of one another. The seeds of division will continue if you do not live by the third Blue Book. You must pray to the Holy Spirit that you will be filled, that He will move in you as the wind to the truth. Jesus: You shuffle your papers and your books, and you are focused on so many things which are so important in order to help bring about the completion of the Fatima mission. But the great lessons that you learn are the ones to be more Christ-like. blessed child, I give you crosses because I love you. You I have loved dearly all through your life. Your crosses have brought you to Me and My love. Life will soon be over on this earth for you. All that matters are the things of God. Love all those around you as if it be your last chance to love. Live each day to love all around you. Live it as if it be your last day to live on this earth. Would you waste valuable time fuming and fretting? Time is short and souls will be lost. They will suffer the loss of their souls. You do not have time for any remorse. Your job is to preach My ardent love to My beloved ones. There is so much sin and so much blindness, but the kingdom of God awaits all those who love and serve the Lord. 3. Mary: My little children, I come to you and I speak to you, for I have been here with you this whole time, watching and guarding you. I am Mary, your Mother, and I tell you to not be afraid, but you are afraid and I am waiting for you to come to me. Come into my heart, for I will lead you to the Heart of my Son and you will not be afraid. You will be courageous and you will be filled with my Spouse, the Holy Spirit, and you will go into the world and you will spread the Word of God alive in your hearts. 4. Mary: My little children of the Father, I watch you as a doting mother watches her child, and you do not feel my presence with you, but I am there, always watching you, always by your side. 5. Mary: What will become of them, the little children that insist on doing their own will? ‘Remember that thou shalt keep holy the Sabbath day, obey your father and your mother’, but they do not listen, they are dumb and they are blind. My little children, they will not listen to their Father. 6. Mary: My Son Jesus reveals to you the plan of the Father here. I say this to you, my shepherds, do whatever He tells you to do. The more you follow the plan, the more you will have peace and joy in your hearts. The more you deviate and do your own wills, the more you will have trouble in your hearts. 7. Mary: Some of my shepherd apostles feel that they do not need to go to Mass daily. This is a great gift that God gives to you. If you are a shepherd apostle, you must try to go to Mass daily, for you need this grace to be able to do the work that my Son has called you to. Some feel that it is better to work at home and to pray at home. It is never better to work and to pray at home, when God is calling you to Mass daily, and you just stay in your bedroom and decide that this is the way that God wants you to spend the day. Arise from your sleep, and go to the early Mass. Be there with my Son, Jesus, for it is there that He will help you with His grace to start the day. I am Mary, your Mother, it is unnecessary for you to talk and talk on the phone, as many have done, for many times you begin to talk about one another. You must constantly focus on Jesus, my Son. When you are on the phone. you must pray your prayers when you are talking to another apostle, if only a shortened version, do not continue. If the four o’clock hour comes you should either terminate the call or pray the shortened version of the prayers. My Son Jesus wants you to pray hourly. If you are talking to another shepherd you should stop and pray. 8. 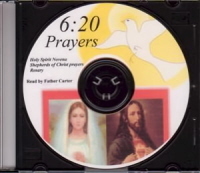 Mary: My Son is giving you great graces when you pray the hourly prayers. If you do not pray the prayers you will struggle tremendously, for the devil will try to attack you and to lead you astray through conversation with others. I am giving to you this key that my Son has given to you to unlock the peace in your heart. It is just to say, “I ask, I knock, I seek through the intercession of the Virgin Mary that I receive grace”. Pray to the Father, in the name of Jesus, through the intercession of Mary, that you receive grace. 9. Mary: I am asking you, my shepherd apostles, that at the hours of 3, 6, 9, and 12, that you pray the prayers if it is possible. If it is not possible and you have a few minutes, you should pray for holy priests. You should pray for the Shepherds of Christ members. You should pray for the Priestly Newsletter, pray for the human family, pray to St. Michael for protection and the angels, and say, “I give my heart to Jesus and to Mary.” Ask that the Precious Blood of Jesus be spread on you and the Shepherds of Christ Movement. These prayers can be recited in a few minutes. I am asking you to be fervent to the prayers, for at every hour it will draw you back to my Son Jesus. It will lead you to God and you will receive the greatest graces. My Son will allow you to suffer if you do not recite the prayers and you are able. 1. R. When I used to teach at Xavier, I had a great love affair with a statue that was there, and I would go in and she would become illuminated and her face would change. And I would cry at the statue when I was upset and I would beg Our Lady to help me to do what God wanted me to do, and that went on for the three years that I taught up there. Towards the end of one school year, my children and I would go and sit up there on the chair, I guess it was in 1992, right in front of her. And I didn’t know Fr. Carter at that time as I taught up there. And we would sit there on the chair, the three of us, and we would pray to Our Lady. And we would go to Mass a lot down at Xavier, and one day we went in and they didn’t have a Mass, and a lady was there with one host, and there was myself and my children and this lady and another man. And she was going to divide this host up into five pieces and it was a small host, but that’s all that we had because the priest didn’t come for the Mass. And while we were there and we were ready to receive the host, (This little chapel is off to the side and has a curtain), this man came in and I think he was somewhere over there around that Blessed Mother statue, and he wailed like I’d never heard a man cry, ever, just at the top of his lungs just screaming out. And so we were in there and we thought, ‘Oh, what should we do?’ And so we just decided that we should let him cry and we should pray as hard as we could because we had all just received communion then, and we would just pray fervently for him. And the man left, and myself and my children went over there to pray the rosary and we went to the statue in which Mary had appeared to me a lot. Mary would appear in light and then her face would change. But my children and I went over there to pray the rosary, and she had this - it’s a stone white statue - she had this welt that went from the corner of her eye, all down her cheek, went under her chin, went down over the top of her chest to where her waistband was on her bosom, and it stuck out about 3/8th’s of an inch and it wasn’t there before. And my children and myself looked at it - we were just astounded because there was this welt that went all the way down there. Anyway, so then we went down about two weeks later and my niece got married in there, and I went over to show my sister-in-law the statue and the welt was gone. And what’s so odd - this was in May of 1992 when the children and I saw it. But this is exactly what Mary said, she said, “I stood beneath the cross of my Son and cried.” So yesterday when I had that book in my arms, and didn’t know why I had the book in my arms, after I had been up all those nights with this pain in my heart that just was awful. And the title of the book was, “Why Do You Cry, Mary?”, and a priest wrote it, and in it all these pictures in there of Mary crying. And I thought we could write to that priest and tell that priest, because we really know from the mouth of Mary, why Mary cries. 2. Mary: I stood beneath the cross of my Son, and I cried for the little ones that would be lost to the fires of hell forever. You, my shepherds, I have called and you have responded, and I must tell you that I am pleased with the great work that you are doing. When you are corrected by my Son Jesus, it is in the greatest love, for you will advance in greater purity and holiness because of the direction that He gives to you. When He admonishes you, you should not feel rejected or unloved. It is with great love that you receive correction, that you will advance further in the ways of the Lord. You will be purified, you will shine glistening, white, and you will sparkle, and you will be the holy ones of which He speaks in the Book of Revelation. You are the ones that God has called to help to lead the children out of darkness into His marvelous light. 3. Mary: The light has dawned on the earth, and a Savior comes forth from the tomb in a glistering light, adorned in the robes of glory and glistening white. You, my shepherds, can see this in your hearts. Many would not comprehend the insights into the mysteries that have been revealed to you. Treasure the gift that my Son has given to you. Thank Him, bountifully, and give Him great love for the gifts that have been given. Do not bicker and fight, thank Him from the bottom of your heart and love one another as the Father intended. For you are being purified, you are being taught. You are children, you are not to be haughty and feel you know everything. If you know everything, why should God be the teacher and teach you? Please, I beg of you, as your Mother Mary, you are children. Children are to be taught by the hand of God. Do not be haughty and brazen, be loving and grateful, and you will grow in greater maturity as children of God. You see as in a mirror you are a child, and then you are a young man, and then you see Him face-to-face. 4. Mary: Little babies being brought forth from the womb of their mother are trained and taught, and they grow to greater aturity in their life. Little babies, being brought forth from the spiritual womb of the Woman from her Immaculate Heart, are being taught and trained the ways of the Lord. Little children are not brazen and haughty, they are open and willing, willing to be taught. Are you a little child of the Father? Are you hanging around my apron and listening as I help you to grow in greater purity and oneness with my Son Jesus? Are you a little child, or are you a big person that knows it all. I see the priests. They must become as little children, coming forth from my Immaculate Heart, and I will place them in the deepest recesses of the Heart of my Son. Little children, you must become as little children. Little children are taught, little children are the ones that are wise. Little children do not know it all. 5. R. And so we go back to the garden and we see Eve and we see Adam. And they were cast from the garden because of what? Doing their own will. And so the garden in the end must be the one where the children will bear great fruit, where they will all show the Father that they do not do willful acts but live according to the will of the Father. 6. R. Father Carter received a message last week, but it is the message that he has had for two years. And it is very important that we see that the Shepherds of Christ Movement will have this religious order and that the messages that Jesus gives to us are right on for the renewal of the Church and the world. And if a person does not wish to be part of this as a Shepherds of Christ apostle, they can do what they wish to do, but then they should be a Shepherds of Christ associate. We need associates also. He is majorly teaching us to be an apostle, but you can come if you are an associate and listen to the directions and learn what He is teaching us. But an apostle will follow the directions that Jesus has given and will live as a religious, whether it be a priest, a Handmaid, or a lay apostle. 7. R. I remember the third Blue Book - it was so hard to get the third Blue Book out. And the things in the third Blue Book and the second Blue Book and the first Blue Book are so hard. And the people wanted to adapt the messages of Jesus to the people that are living now, and change them so that they would be accepted by the people and their standards. How silly, you say. The earth has veered so far off what the Father wants. He gives messages to put them back on the right road, and then the people that receive the messages here today are going to take the messages and adapt them to the people of the earth. 8. Jesus: Your Church is in need of renewal. The earth and thepeople of this earth have veered so far from one side or the other. The people of the earth are sick, and I give to you the Mighty Medicine. You, My apostles, must study the Blue Book messages and live by them. You must study the Apostles’ Manual. You must pray the rosary every day. Great protection is given to you, great lights of knowing insights into the mysteries when you pray the rosary. I am Jesus, I give to you the plan of the Father to help to bring about the completion of the Fatima mission. Will you comply to the wishes? 80 years later, the Church still does not follow the directions of their Mother given at Fatima. 9. Mary: I am Our Lady of Fatima. I have given to you this mission. My Son Jesus has called you, the shepherds in the Shepherds of Christ Movement. The shepherds guarded the flock. It is through this Movement that the Church will be aided greatly into becoming one fold with one shepherd. I am Our Lady of Fatima. Mary: I am Mary, your Mother, and I ask you to give all of the requests that I have given to you concerning the building in Florida to the owner, Mike. I wish this to be a center of Eucharistic adoration. R. Think of the image on the building in Florida, and that Mary does not have any eyes. Jesus speaks: Do you think I acted on your soul less when I gave you the experiences of hell? Messenger: Oh Jesus, He took me to the heights of ecstasy in Him in realizing how He is the Initiator and acts on my soul. How foolish I am indeed to think it is I who control the workings of God on my soul, when in fact He is the Bridegroom of my soul. Jesus speaks: I give you the peace of the Sacred Heart of Jesus when He acts on the soul of His spouse. I am the Lamb of God who takes away the sins of the world. I am the Spouse of your soul. I give you this satisfaction so that you will write to Me after Communion for My Mass Books for the world. This book will be entitled the Spouse of the Lamb. I will act on your soul most intimately. Messenger: Oh my God - how to explain that which happens when You act on my soul and what I experience. Are there any words that could do this justice when the Almighty God finds favor with me most intimately, and gives Himself to me? Jesus speaks: My child, I act, you are passive, empty and open. Surrender and I will possess your soul with the lights of heaven so you can experience your Divine Lover most intimately. Surrender, surrender, surrender, a state of being and surrender to live in Him at the point of greatest intimacy in the Mass. Messenger: And the Bridegroom comes, He summons the soul. Jesus speaks: I am the Way, the Truth, and the Life. The life flows from My Sacred Heart to My body, the Church. Many never mention the Sacred Heart of Jesus. Messenger: Blood and water poured forth from His most Sacred Heart. Blood a symbol of the Eucharist, water a symbol of Baptism. Passion is a way the devil can lead a holy soul to death. Jesus calls us to holy love. He calls us to brotherly love, love rooted in God. You have seen me through so many doors and windows of my life to take me to this place with Thee. I write as I hear the nine o'clock bell toll, my God, so beautiful to my ears for I know at every second of my life the bell tolls, for I help in my life in the act of redemption by pleading for the souls of this earth. Deep in my heart is such joy to be here at Mass for I know of the great grace that will be released. I have the great privilege of helping to release the grace. Oh God, I love in such intensity as You elevate my ability to love and know in You in the Mass. The word Father has such meaning in my heart and soul for I love Him so. It is He that I live to please. It is my Father I wish to please at every moment by living in His Will. His dominion is forever. Christ is our King, forever. We gather here to worship, adore, thank and love Him, to beg Him for help in all our needs and that in this great sacrifice He will outpour His abundant grace on the earth. Oh that I could write in the deepest union with my Lover and be as He desires me to be in this Mass. I unite in the depth of union in my soul. He acts on my soul. His is the initiator, I am the soul, willing, waiting and wanting Him. I come to the Mass open and ready and with the burning desire for Jesus to act on my soul. He is the Bridegroom of my soul. It is this spousal relationship our beloved Savior desires to have with the soul. He wishes us to be the spouse of the Lamb. We do not fully comprehend why our God allows us to struggle and go through many trials, but in living at every second, accepting all He sends to us and living only to please Him, loving Him so deeply in our heart and loving all others, great grace is released at every second of our lives. Our dying plea is that we please Him, love Him and help in the work of saving souls. We are the children of Eve, but our God raises us to such heights by allowing us to share in His divine life through Baptism. What a gift that God elevates our human nature to this level to share in His divine life. In the Holy Sacrifice of the Mass He outpours His abundant grace on us and on the earth, for it is the sacrifice of Calvary, sacramentally made present in the Mass, and we unite in this Holy Sacrifice. Should not our hearts be filled with such joy and adoration and thanksgiving that God gives us this great gift of His love? Oh my God I am overwhelmed with your gift to me. I unite with You and with the grace You have outpoured to me. My very act of existing in You in the Mass is the act of loving and praising and worshipping You. Oh my God, I truly adore You and want You to come to me. I fall to my face and call out with the greatest emotion Holy, Holy, Holy Lord, I adore You. Oh my God help me to teach this world of the great gift You give in the Mass. In the moment of Consecration grace is outpoured on this sinful world. My God, I truly adore Thee and love Thee so intently and thank You for Your gift to us. My heart pants to receive You and I feel my heart beating so within my breast. For my God, the Almighty God gives Himself to me. Oh Lamb of God I adore Thee. I want only to love Thee more and more. My beloved Spouse, please come to me. The little bride approaches the altar and the Bridegroom gives Himself so completely to her. My Spouse, I write to Thee, I do indeed love Thee so. If we but fully realized that this is truly reality, that God loves us so much that Jesus, our beloved Spouse and Savior, gives us Himself in the most intimate union. All the petitions are given to Thee my Bridegroom, at this moment I ask You to possess my soul and implant on me knowledge of Yourself as never before, so that I am so intimately united to You that I will be deeply transformed more and more into Thy image and likeness, that my ability to love and know and act like You will be heightened to a great level as I exist in You. I truly give myself completely to You and wish only that this moment with this intense union with You would linger forever until I am united with You in holy wedlock for all eternity. The spouse of the Lamb, this is my mission in life to more perfectly grow in this role, to live every moment to please Him my beloved Spouse. As persons live to please their earthly spouses and those they love, I live to be the spouse of the Lamb, to please Him and to live always to please my Beloved. In the reign of the Sacred Heart there will be harmony and peace as men live at every single second with the burning desire of their hearts to please and love their beloved God. He will be their God and they will be His people. There will be peace and love in all hearts. Men will know God and want to serve and love Him. My beloved Bridegroom, this is my dying plea of my life, to serve You, to worship You, to adore You and to carry the good news of Your gifts to us to the far ends of the earth. I beg You for the grace to help to serve You more. I love You my Jesus, You are my God. Our Lord Jesus has asked me to write to you as the spouse of the Lamb. We share in the heavenly banquet of the Father in the Mass. We are the children that come around the table of sacrifice and give ourselves in holy love to our God. We come to unite in the deepest intimate union with our God in the Mass as He gives Himself to us and we give ourselves to Him. He wishes us to be united to Him in the most elevated mystical marriage. He is our God, we are His bride. He wishes us to live in this heightened state of mystical union with Him. Jesus told me this day to begin writing on the Internet as the spouse of the Lamb. Only those accepted in the Catholic Church are permitted to receive the Eucharist through the Sacrament of Holy Communion. This is a gift God gives to us. He wishes all His precious souls to receive this great gift, the Bread of Life He gives to them. It is in receiving this Sacrament that He outpours abundant grace to us. Grace is a gift of sharing in His divine life. The more I go to the Eucharist, the more I go to church and adore our beloved Lord truly present in the Sacred Host in the tabernacle, the more He gives His overwhelming grace. It is from this reception of the Eucharist and adoration before the tabernacle I have grown more and more in my union with Him. It is in these moments He has implanted great knowledge of Himself within my soul. It is in this great gift that I know more the burning love of the most Sacred Eucharistic Heart of Jesus. God is with us, He is truly present in the Eucharist. He is the Almighty God, as present today as the day he walked the earth. He is the King sitting on His throne in the tabernacles of the earth. He wishes us to come and worship and adore Him and He outpours His grace to us when we come. We are transformed more and more into His image and likeness and He lives and dwells in us more abundantly through this grace. This is the message I received this day from Jesus for the daily message. I wish you to tell all about the spouse of the Lamb on the Internet. I am Jesus, I write to you this day, teaching you through My messenger. In no way has she reached this perfection of dwelling most abundantly in Me. She is growing more and more in her intimate union with Me in great struggles and love. I wish to share this account with you that I have written to you through My chosen soul, that you too will pray and live as the spouse of the Lamb. I desire to be the Bridegroom of your soul and unite most intimately to you. I give Myself to you in the Holy Eucharist. so that a person may eat it and not die. Mary speaks: My children, feel the emotion in my Heart and the Heart of my Son Jesus on Calvary. The desire in Our Hearts is that each and every precious soul would be saved, but experience the emotion to know clearly that some will be lost and some will be saved. Jesus speaks: I knew them each by name. When I gave My life for you, I loved you to my death on the cross. I AM YOUR LOVING SAVIOR. I COME TO YOU THIS DAY. Jesus speaks: My children, experience the emotion of Our two Hearts on Calvary in your hearts at Mass. Feel the emotion and the burning, consuming love of My Heart for souls. Messenger: At Mass I experienced the many faceted Hearts of Jesus and Mary. I experience the thirst for grace for the souls. I beg for this release, experiencing some of the emotion of Jesus' and Mary's Hearts on Calvary. Hang with Him in bitter pain and know His consuming love for souls. Experience her joy and suffering, knowing souls like Oscar and Scotty (message December 7, 1998). Feel the emotion of the message of December 12, 1998, when they woke me on the feast of Our Lady of Guadalupe in utter agony and pain. My beloved brothers in the Shepherds of Christ Movement, plead at every Mass with me for the redemption of souls. 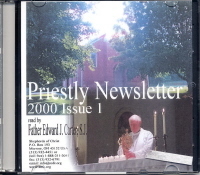 Circulate the newsletters 4 and 5, 1998, to priests that they will unite in the pure and holy Hearts of Jesus and Mary when celebrating Mass and will PLEAD, PLEAD for souls, the souls He loved so on Calvary and shed His Blood for, the souls He gave His life for. We plead, Father, for grace and mercy. We unite with our Savior, The LAMB of GOD, we are SPOUSES of the LAMB coming in the Immaculate Heart of Mary, pleading for souls that they will be saved. We come to you, Father, as a body in the Shepherds of Christ Movement pleading for grace and mercy for souls. Please hear our prayers. Jesus speaks: I come and I give Myself to you, I long to hear you say to Me, "My God, I want to be alone with You." I long for love. I long for time that you would give to your most intimate friend. I long for a relationship with you. I long for you to want to know Me and know My great goodness. Such favor I will pour out on the soul that just wants to adore and love Me. Spend your time today just thinking of the great love we share with one another. Spend time alone with Me, not being busy reciting prayers, just savoring Our time together. You would sit and hold hands and embrace those you love. How little time you spend with Me, just being, existing in God’s love, being wrapped in the embrace of the Father, Son and Holy Spirit, existing in Me. I love music and songs of worship and joy praising God. Sing to Me. Love Me. I want your favor. A glance, a hand held, the heart that skips a beat, are not all these signs of great love between friends? Is it not important to you that you relish and look for the moments spent alone with Me? I am God, I loved you so much, I died for you. I gave willingly of Myself for love of you. Oh you carefully plan words you say to one another when you want them to love you in an intimate relationship. How it would please Me that you thought of special words of love and appreciation to say to Me! Oh, My children, when you visited My sick one you visited Me. Say to Me on busy days, "My God, I see Your eyes in their eyes. I do this, My God, to You when I love them." Take time in the day to be alone with Me. Give Me this pleasure, that I am in all you do. You administer to others and see Me in them and when those special moments come for us, you say, "Oh God, how good it is to be alone with Thee!" I love you so much, I am a jealous lover, I wish your time spent alone with Me every day. In your bed at night, I wish your thoughts to be of Me. Your God wishes a special presence with you in your bed, in the 6:30 p.m. prayer services, before the tabernacle. Experience the presence of the Father, Son and Holy Spirit with you in these treasured moments. Be alone with Me. My Jesus, I truly love Thee with all my heart. My desire now is to be alone with Thee. My heart wants Your presence, especially after the reception of the Eucharist and before the tabernacle. I long to see the Host elevated. I long to worship and honor You and beg for grace. My heart skips a beat when I see the elevated Host, even when I ponder it in my mind. I am in great awe and have great joy at Mass when the Host is elevated. I wish to unite to it at every moment as Mass is celebrated around the world. I see the glow around the Host as in this picture of the elevated Host. It is far more beautiful than this picture, it is there and I see it. Oh my God, I thank You for the gift of the Eucharist. Oh my God, I thank You for Yourself. R. We are spouses of the Lamb. I give my heart to Jesus and Mary with you in love. We are one body, we are the body of Christ. We are the members of the Church. The Church is wed to Him. The Lamb was slain for our sins. We intercede for our Church and our world in the holy Hearts of Jesus and Mary. He is our Spouse. He loves us so much. He is the Bridegroom of our souls. I saw the gold cup of His Blood. It glistened and was molded so purely. I knew that the power was in Him. I am a spouse, I come in purity and submissiveness. I give myself to Him. He is the Head of the body, His Church. I am a member. The foot is not the head of the body. Neither am I the head. I am a member of His body through Baptism. I intercede with all my heart in Him, but I may not even know what is happening. I keep in my heart always, THROUGH HIM, WITH HIM AND IN HIM. I live my life with the desire to live in purity, living in faith, recognizing my weakness and dependence on Him. I minister to those in my family, I am a mother, a wife, a child of my mother. I do His will, that is what is most important to me, doing His will and uniting at every moment to God in the Holy Sacrifice of the Mass. I am a spouse of the Lamb. I offer the Sacrifice united to Him. It is most pure, for I unite to Their holy and pure Hearts. I do not see the fruits. I have faith that He will hear my plea. I am united as much as possible to the offering of that Sacrifice. I assume my role. I do not shun my duty, and not do as God wills me to do. Everything should be in balance, according to His will. I cannot take care of adult children all my life. This is not His will. I must take care of children under a certain age, this is His will. I do not abandon my children, I am always their mother. I pray for them constantly in all I do. I should do everything in proper proportion according to His will, united with all others in love. We must be hearts of love, depending on Him, our beloved Christ, Head of the mystical body. I AM a spouse of the LAMB, I give my life to you, in loving service. I am under His feet. God the Father, help me to know Your will and help us to be instruments to help lead the Church and the world into a greater love union with God. God the Father, Son and Holy Spirit we give ourselves to You and ask You to help us. We love, praise, worship and honor You. Messenger: Today I wade through the struggles in giving the message to the earth. Today I received a message from Mary how important it is to get the daily messages in book form. Before the first Rosary Book went out, it was a tremendous struggle. Before the second Rosary Book went out with the Imprimatur, there were also painful struggles. Mary, you and the Father wish these messages to be published and circulated in book form. Satan has created every distraction to block the accomplishment of this task. He must increase, I must decrease. I have delivered the message to the world. The proof that heaven wishes to give a message is in the image of Mary on the building. Jesus, I beg You for help to accomplish this task. I am immensely frustrated that Blue Books IV, V and VI never were published. I remember all the obstacles, but no one can stop You. I beg You to handle this situation. I sit with a message from Mary yesterday and today and I am unable to accomplish this task on my own. It takes many people surrendering to the will of God and responding in faith. More than anything, it takes Your grace and Your might. As Your spouse, I implore You to help me, please grant grace that the people will answer the call to help me answer Mary’s requests. She also wishes the tapes of these messages to circulate. Jesus, please grant the grace that men will see and not look away. Messenger: I love You, I am Your beloved child and servant. He is our Spouse. In such oneness, we come to the altar of sacrifice to offer sacrifice to the Father in His name. We can understand the great intimacy between husband and wife. Christ uses the spousal relationship to denote oneness. There is a deep mystical union between Christ and His Church. We have a deep mystical union with Him. It is not the same as a relationship between a husband and a wife. It is a much deeper relationship, one on a mystical level between the Divine God and His people, between Christ and His body. And so we offer a profound sacrifice to our God, through Him, with Him and in Him, so intently one with the Chief Priest and Victim. This is indeed a deep mystical union and a divine mystery. It is to our benefit as His people to beg for greater union with Him as His spouse and to identify more with our Master, Chief Priest and Victim, in every Mass and in all our actions all day, united to the Masses being celebrated around the world. We are one body in Him. He is the Head, we are the members of His mystical Body. He is alive. He is alive. He is alive. He lives in us in a special way when we are in the state of grace. He has given us this sharing in His life. Thank You, Jesus. Thank You, our God. I am revealing to you the workings of Satan in your lives so that you will be able to withstand his attacks. I love you My spouse, this is My gift. Jesus speaks: I am the Bridegroom every bride desires. I am a Divine Lover. You want one that can only give you what I can. Every bride wants a spouse, for you were created for Me, your perfect Spouse, and you will only be satisfied by Me. Your handmaids and servants are so happy because they live to be My spouse. I am attentive, I am always there, I always love you, I give Myself in the Eucharist as no man could ever give himself. Your spousal union with Me comes first. I "fit the bill" for everything you crave in a spouse. I wait for you. I loved you to My death on the cross. I am your ardent Lover. I am the gallant One. I am Your Spouse, I give Myself completely to you. My Father loves you so He created you for Me. The Holy Spirit can fill your heart with fire for this love union with God. You are the spouse of the Lamb. I longed for you, my Jesus, to receive you within My breast. I've longed to have you inside of Me. Oh my Jesus, I want to be with You as You are in the exposed Eucharist, and it is my delight to just be with You, the Almighty God, truly present and sit with You and gaze upon Your splendor. Oh, the excitement to know God is really there in the consecrated Host. It is so wonderful to just be with Him in such deep union, and my heart is just so filled with love for God and all others. The treasure is the Eucharist. Oh God, my heart burns to receive you in the Mass and for You to be with me in my heart right now. To just be with Jesus, the Son of God. I want to write about Jesus. What would I do if I knew today was my last day on earth? I would do exactly as I am doing, for I believe I am living according to His will. I would do it with the greatest fervor, uniting as deeply as possible every moment to the Holy Sacrifice of the Mass for souls. I would pray as fervently as I could for My family and the Shepherds of Christ family, the Church and God's family. I would give my all as deeply as possible to the moment and surrender all else to Him. I would go deep inside myself and try to unite as deeply as possible in my heart to the Father, Son and Holy Spirit. Every moment when lived fully united to the Holy Sacrifice of the Mass can help to release great grace for souls. Oh God, I love You so much and I love souls. 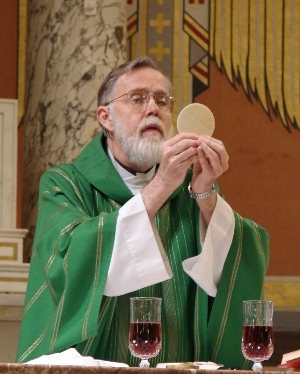 I would tell everyone on the earth about Jesus in the Eucharist, and I wouldn't care what they thought of me because that is such a gift to tell them about. I would spend time with Jesus in deep union at Mass and before the tabernacle and I would unite as deeply as possible with all others in my heart. I would pray as Jesus has taught us in the Our Father and I would recall the Gospel of John, chapter 17, in my heart, praying and offering up my whole day that the world would be one. I would ask God to send love to all that I have ever had a problem with and shower the earth with healing grace. Now, my God, there is so much more to write, but I would wish that I could live that day as You will it, deeper than ever, uniting to the Mass and all others in holy prayer. I wish that I could give you the greatest love and honor and adoration and I would pray more fervently than ever for our beloved priests and the most wonderful Church and the world, asking God to help me live the day according to God's will to the fullest. I love to be with Jesus in the tabernacle. I want to have joy in every moment. I love to pray the rosary and think of the mysteries of the rosary before Jesus and pray for my needs and the priests and the Church and the world, especially praying for my beloved family and friends. Oh, Jesus, as I go to the rosary today in Florida, I pray for grace for the priests, the Church and the world. I ask all to unite with me in praying every day as a body for our beloved priests, the Church and the world, as we are united to the Holy Sacrifice of the Mass. Let's feel this connection to one another every moment of the day, praying for grace to be released for souls, for the Church and the world. I love you all so much. May God's blessings shower your lives as Jesus takes you ever deeper into His most precious Eucharistic Heart. to be so united to You in the Eucharist. My life centers around the Mass. writings on Ash Wednesday February 25, 1998.